Huggacast 73 (available in high quality) features video from the Seattle Cyclocross race at the Evergreen State Fairgrounds. Andrew and I raced single speeds. As I learned, on a single speed, it’s all about pedaling and technique. I wasn’t fast, but I think rode a good race. Steady, no crashes, and making room for those in contention. No tensioner or 1/2 link. The bike handles exceptionally well and I attribute that to the scandium frame, carbon fork, Tektro carbon brakes, and Hutchinson tires. 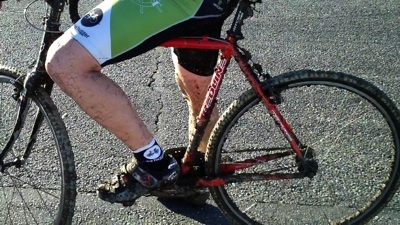 Back in the day, when I raced cross more often, I would’ve endo’d going into the slop that the Hutchinson tires handled. In the first 2 laps, I couldn’t believe what I rode through without going down. Same thing when descending and controlling the bike with body english and a light touch of the brakes. While certainly hard, I found racing a single speed liberating. I just focused on pushing through the mud, the runups, and a manageable pace. No worries about shifts, missed shifts, or a derailleur. The single-speed technique on the fast sections is to get up to speed and coast, letting the legs recover. I go out moderate and try to build speed and placings during the race, picking off those that blow or break something. By the 3rd lap, I was in groove and finished on the 5th as a lapped rider. I don’t know if I had the right gear choice or was just not in any sort of cross shape, but while pedaling hard, I wasn’t grinding and did spin out on the pavement (and recovered). I don’t know what market there is for single-speeds, maybe it was just us 30 guys at the race, but there’s certainly enthusiasm and lots of talk about what works and doesn’t. I’ve given Redline lots of input and hope they bring a single-speed frame to market in 09.